There are a lot of good law firms who handle tort cases. But not all Maryland personal injury law firms are equal. The law firm that you hire for your serious injury or wrongful death claim will determine the results you achieve for your case. 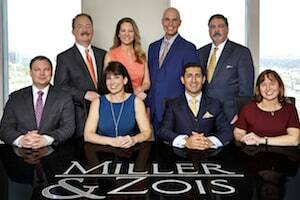 At Miller & Zois, our lawyers focus exclusively on personal injury claims, specifically serious traffic accidents, malpractice, premises liability and pharmaceutical drug injury cases. Our law firm was founded 13 years ago with a simple philosophy: to bring our years of insurance defense experience to work to get outstanding financial recoveries for tort victims. We put our clients on equal footing -- and then some -- with the insurance companies to make a fair fight. Every single person pictured above comes to work every day to maximize the value of our cases for our clients. What sets us apart from many other personal injury law firms? As you see to the left of your screen, we have a remarkable history of getting results. Without a real record of success, everything else is just talk. Does the result in one case guarantee or predict the outcome of another? Of course not. But a history of great verdicts and settlements is a loud message to anyone in our path of getting our client getting the compensation they deserve. Our clients will always have fighting for them a seasoned, skilled trial lawyer with a track record of outstanding verdicts in personal injury trials, rather than a lawyer who rarely enters the courtroom. We don't have junior lawyers handling cases. All of our lawyers are respected trial lawyers who have a history of winning at trial. We have successfully represented clients in thousands of personal injury cases. We have handled nearly every type of personal injury case - from car accidents to medical negligence to products liability claims. Our lawyers focus on maximizing the amount of money clients recover in a personal injury accident. This includes finding insurance, getting the insurance company to pay, and often fighting to reduce the medical liens and bills to increase the amount of money the client puts in his/her pocket. The lawyers at our personal injury law firm zealously fight against the defendants – usually insurance companies - to get you the best value that we can for your accident, malpractice or product liability case. When you have been injured by a negligent party or by a product manufacturer, you need a personal injury law firm with a reputation for success and a history of results to back up that reputation. You may be thinking, I want to settle my personal injury case so why do I care if my attorney settles all of his/her cases? The reason is that an attorney will not maximize your recovery. Insurance companies keep track of lawyers' trial records by doing a computerized search based on the law firm's taxpayer ID number. If your lawyer settles all of his personal injury cases, the insurance company will be aware of this and will reflect this knowledge in the offer you receive for your claim. So if your lawyer does not try personal injury cases, the insurance company knows the lawyer will settle and will make their offer based on the fact that they know there is no real “hammer” (which is what a lawsuit and trial are to insurance companies) behind the lawyer's demand. The focus of our personal injury practice is serious injury and wrongful death cases. If your injuries are not serious, we may not accept your case and might instead direct you to another lawyer who we believe will better suit your needs. If our lawyers do take your case, you will have the undivided attention and dedicated efforts of the experienced, skilled trial lawyers handling your case each step of the way. When you hire Miller & Zois, you are hiring attorneys who are recognized as being among the top lawyers in the state of Maryland. We have received recognition and numerous accolades from their peers, recognized by SmartCEO, SuperLawyers, Best Lawyers in Maryland, What’s Up Annapolis, and other publications. Ron Miller is a professor at the University of Baltimore Law School, instructing students in Insurance Law, and a prolific writer on personal injury and insurance topics. Laura Zois and Rodney M. Gaston are on the Board of Governors and chair committees of the Maryland Association for Justice (formerly the Maryland Trial Lawyers Association). Ms. Zois frequently lectures at seminars for lawyers in Maryland and around the country on handling personal injury cases. Our personal injury law firm is committed to helping not only our clients but personal injury lawyers and injury victims throughout Maryland. If our law firm takes your case, we are in it for the long haul. We will take on whatever expenses are necessary to bring the best possible result. On particularly complex cases, our lawyers work with a superior team of medical and technical experts. We just the best accident reconstruction experts in complex car accidents where time, speed and distance are critical; board certified doctors in various medical specialties; vocational rehabilitation experts who can speak to future lost wages; as well as economists and engineers. Consulting with these qualified experts allows our personal injury lawyers to build your case. We will thoroughly investigate every detail relevant to putting your case in the best possible light that we can. Miller & Zois is a 100% contingency fee personal injury law firm. Our law firm receives a fee in a personal injury case only if we recover money damages for you. If you do not recover anything from your accident or malpractice and we spend money preparing your case, we absorb all of the costs, not you. Our lawyers never ask our injured clients to front expenses and costs. If you have been injured in a serious car accident or are the victim of medical malpractice, contact our team of personal injury lawyers to discuss your case. If you have any questions for our attorneys, you can reach our law firm at 800-553-8082. For a free consultation with a Maryland personal injury lawyer via the Internet, click here.